This area of York was badly damaged during the siege of York in 1644, hence the lack of obviously historic buildings in the area outside Walmgate bar, but this surviving section of the old church has been retained, and is now in the care of the Churches Conservation Trust. I passed by on one of my summer evening wanders, and noticed restoration work was in progress on the carved stone of the doorway. So much work goes in to maintaining these ancient structures we have in our care. Indeed, I’ve been unable to find any information on the web, while compiling this page, about the replacement stonework on this lovely old structure. 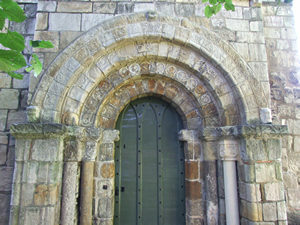 But someone somewhere is carving stone to replace crumbling stone in the doorway of old St Lawrence. 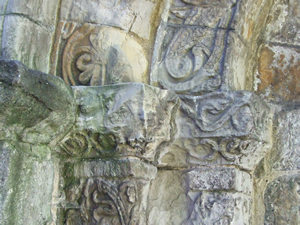 The official English Heritage description of this doorway, from Images of England, reads: "the doorway has a semicircular arch of 4 orders: the inner order has plain voussoirs springing from moulded imposts over scalloped capitals; the second order has an interlace above 2 monsters springing from capitals also carved with monsters; the 2 outer orders are carved with formalised foliage." I can’t tell you if the details shown below – the new carving inserted into sections of this doorway – faithfully copy what was there before in the crumbling stone, though I imagine they do. 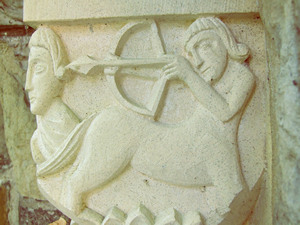 My Pevsner guide mentions a carving of Sagittarius – the newly carved replacement is shown here. 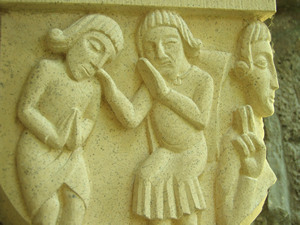 I can’t imagine the skill it takes to carve stone into shapes that convey so much. And just like the craftsmen who carved the original doorway, this talented person, or persons, will remain unknown to most of us. 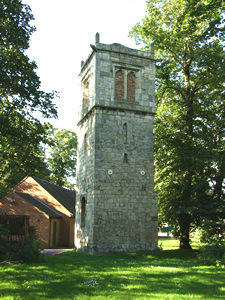 In the churchyard of St Lawrence’s, close to this old church tower, is the Rigg family monument.